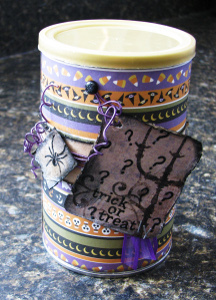 Hold all of your Halloween goodies in this festive trick or treat can from Rita Barakat. Make one of these Halloween craft projects with scrap paper and easy embellishments. Get an empty can, preferably one with a lid! Measure the can, mark and cut the paper. I used the "Smell my feet"paper form Ta Da Creattive Studios. Wrap it around the cand and hold it in place with Glue Dots (R). Cut the die cut papers down to size, rip, distress and ink the edges black. Punch a hole inthe can to put the brad in- leave it loose so you can wrap the wire around it. Wrap the wire around the border and attach the die cut with the wire. I used a Glue Dot (R) to hold the spider in place. Staple ribbons into place and fill with treats! So stinkin' cute and seems easy to do! Off to find an empty container :) Thanks for sharing your inspirational project!